When the Twilly was created back in 2004, it was an instant hit. The 86 cm by 5 cm gem of a silk piece which came in cute round storage boxes could be worn in a multitude of ways: tied around the wrist as a bracelet, worn around the neck as a scarf or even looped around the handles of your beloved Hermès bag. And today, the Twilly family includes a bigger size known as the Maxi-Twilly (160 cm by 20 cm), as well as a longer and thinner version that was unveiled earlier in the year. And because some of you might be unfamiliar with the latter, here are 5 things to know about the Twillon (SGD330), the spotlight of today’s post. 01 – It measures 193 cm by 3 cm, making it the thinnest and longest piece in Hermès’ entire carré lineup. 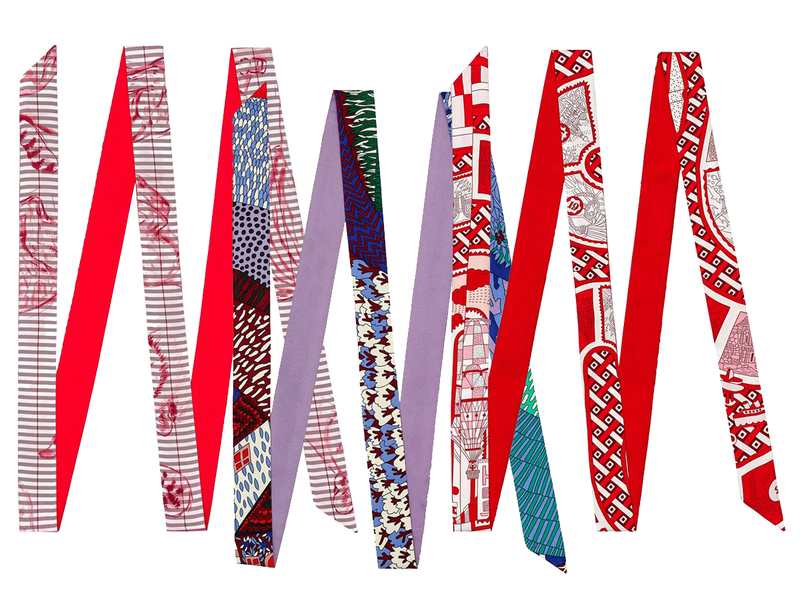 02 – Each Twillon is cut from a silk scarf, which means no two pieces are exactly the same, even if they all came from the same piece. 03 – It’s a versatile piece that can be worn in different ways. Braided around your bag handles. Looped around your waist like a belt. Tied around the neck like a choker (or even worn long like a neck tie), worn as a hair accessory, the possibilities are truly endless and only limited by your imagination. In other words, time to get creative. 04 – As the Twillon is made of silk, avoid contact with harsh chemicals and send it to a professional to have it cleaned from time to time. Store it flat and untied (no knots) to ensure that it retains its shape over time. 05 – It comes in a myriad of prints, some of which you might be familiar with, like the Baobab Cat and Jeu de Soie, which are also available in a full square scarf version.